CHICOPEE – After two years of crashing on a lumpy couch at a friend’s house, disabled Marine veteran Ferris Shelton finally has a home of his own. It isn’t only having a real bed, a bathroom , a kitchen and a spot to teach himself how to play the keyboard that is special. Moving into the new Soldier On complex at the old Chapin School is giving Shelton and other down-on-their-luck veterans a chance to get back on their feet. 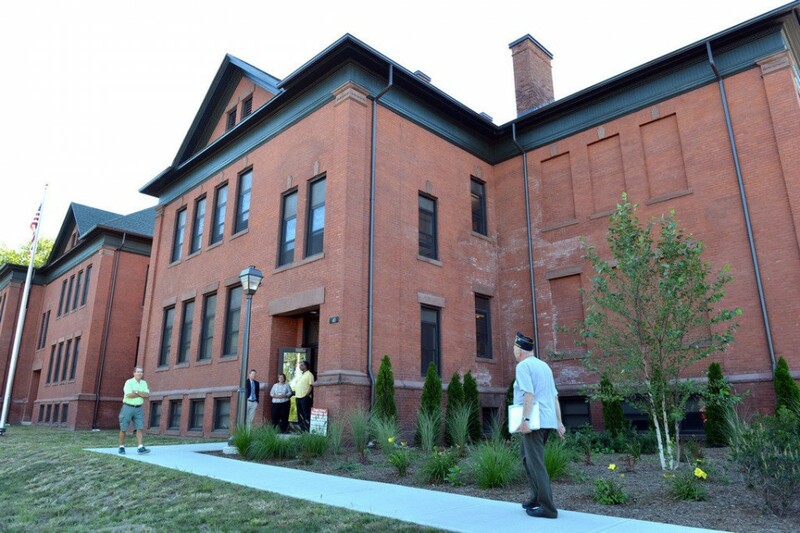 Thursday, Soldier On held an open house to show off the nearly 120-year-old building that has been converted from a vacant elementary school to a 43-apartment home for homeless veterans. Construction was completed in late summer and the first 16 men have moved in over the past two weeks. Each apartment is a little different and Shelton had his choice of units. He selected a corner apartment because he figured he could open the windows and get a cross breeze. His is one of the apartments that still has one of the original blackboards hanging on the wall. Life wasn’t always so hard for Shelton. He served active duty in the U.S. Marine Corps for three years and after being honorably discharged he married, had children and worked at Milton Bradley for 16 years. But after a divorce, his life went into a tailspin. “I lost my way with drinking and debauchery,” he said. Eventually he found Soldier On, which started him on a road to recovery. He attends Alcohol Anonymous meetings, reads a lot and is teaching himself to play piano. Once he settles in more, Shelton said he hopes to start looking for a job and also talked to Kos about volunteer opportunities with veterans groups. Even in the short period of time he said he has found that the residents are becoming friends and supporting each other. “We have one thing in common. We took an oath to protect the country and not everyone did that,” he said. The $7.3 million rehabilitation was done in a partnership with O’Connell Development Group of Holyoke and was funded with a variety of different sources including affordable housing grants and historic tax credits and City of Chicopee contributions. Western Builders renovated the building, said Bruce Buckley, chief financial officer for Soldier On. “It was a great partnership. It was a pleasure to work with everyone,” he said. The complex is set up as a housing cooperative. The residents must be veterans and earn no more than the federal low-income requirements of about $28,000 a year. Each first pays $2,500 for a share in the cooperative, and then pays a monthly rent that is 30 percent of their income. Every tenant is different, some have veterans’ benefits, others have social security and some work, he said. The most any resident pays is $883 a month, but rarely does a veteran pay the full amount. Some residents pay as little as $50 a month, Buckley said. While the $2,500 seems like an insurmountable amount for the veterans, who were either homeless or at risk of being homeless, local banks and other organizations have donated money to Soldier On, to be gifted to anyone who cannot come up with the money to pay the initial fee, Buckley said. To manage the building, residents and Soldier On employees form a board, similar to a condominium association. They oversee finances and set rules for the tenants, he said. Soldier On also continues to provide services to tenants including counseling, transportation, job help and anything else they may need. Counselors will come to Chapin Housing to meet residents in their own homes and there are also a few small offices in the building where they can talk, Buckley said. “We bring the services to them,” he said. Currently about 55 people have applied for the 43 apartments. Soldier On officials are still sorting through the applications to select the remaining residents of the Chapin project. Those who are not selected may have a chance to be placed in Agawam, sinceSoldier On is renovating the former Western Massachusetts Regional Police Academy and building 52 apartments there. Kos toured the old school and said he was mayor and School Committee chairman when the board made the difficult decision to close Chapin in 2003 as an elementary school because of budget cuts. For two years it was used as an alternative school before it was shuttered in 2005. “This is a positive use of a former school,” he said, thanking the City Council, local veterans agencies and department heads for their support for the project. Among those who toured the school were a number of former teachers and the retired principal John Coach and his wife, Joanne Coach, who worked as vice principal at nearby Gen. John Stefanik School. “I can’t believe how bright it is. We did not realize how dark it was at the time,” said Donna Dinsbach Valliere , who taught kindergarten at Chapin. She and Linda Low, also a kindergarten teacher, pointed out the hallway in the basement saying that is where children had physical education classes. “What a great idea for veterans. What would we do without veterans?” Lowe said. As a condition of receiving historic tax credits, some of the school features had to remain, including the wide hallways. Some apartments also have the original blackboards, Casey DiCicco, communications director for Soldier On, said. Each unit, which measures about 500 square feet, has a bedroom, a bathroom and a living area and kitchenette complete with stovetop and microwave oven. Each is furnished with a new double bed, a recliner, a dresser and small table with two chairs, she said. James Baer, a case manager at Soldier On, is one of the veterans who has applied for an apartment at Chapin. Baer, who currently rents an apartment in Haydenville, said he was living in a homeless shelter in Worcester and was such a desperate alcoholic that he drank mouthwash when he couldn’t buy liquor. A veterans’ shelter in Worcester connected him with Soldier On in 2007 and it saved him. Baer said he eventually found a job with the organization. Baer said he joined the U.S. Marine Corps as a teenager in 1975 and spent four years in active duty. “I got out of the military at 21 – I was an alcoholic at that time,” he said. For most of his 20s Baer said he went through a cycle of being hired and losing jobs because he was drinking. By the time he reached 30 he stopped drinking, married and started a family. When he divorced at the age of 42 he started drinking again and ended up homeless and desperate. Soldier On helped him out of the cycle. Baer said he relapsed a few times but staff offered him a helping hand to get back on track. He has not had a drink since February 2010 and the former metal worker also found a new career with the organization. He was first hired as an intake counselor and then studied at Westfield State University to become certified as a substance abuse counselor. At 58, Baer said he is now enrolled at Holyoke Community College and eventually hopes to earn his bachelor’s degree in social work. Not all Soldier On clients have substance abuse problems. Some suffer from post traumatic stress and others have other problems which make it difficult for them to function without help, he said. Soldier On does like to have a staff member or two living in Chapin School to help support their fellow veterans in case someone does need help. Baer said he meets the income guidelines and other qualifications so he hopes his application is selected. “I like working with the veterans. They are in the same position I was and I can see they are making the same mistakes I did,” he said. COLONIE, N.Y. (NEWS10) — An organization that helps homeless veterans will finally have a location in Albany County. The Soldier On program received a 50 year lease for the vacant Ann Lee nursing home in Colonie. The building that used to house the elderly of Albany County, vacant for nearly a decade, will now be used to help another vulnerable group of people in the Capital Region. For the next 50 years, Soldier On will use this site to house and treat homeless veterans. The push to find a place for Soldier On in the Capital Region has been strong for the past four years. “It’s our time as a society to come and put our best foot forward for these veterans and help them get back on the right track,” County Executive, Dan McCoy, said. It’s been a dream for County Executive Dan McCoy- A veteran himself. Finally a reality, McCoy says he’s proud to see the old Ann Lee nursing home put to good use. “To get the nursing home where it can be apartments and then adding on, there will be wings coming off that will be apartments,” McCoy said. After completion, the $30 million dollar project will provide housing, treatment, and a safe place for homeless veterans. County legislator, Todd Drake, says he credits McCoy for his hard work and says getting Soldier On a spot to provide these services was part of what drove him to run for office. Drake says it’s important for the community to do all they can to help those who served our country. “You have people out there who have served this country and served this nation- some of them who are lost and need help,” Drake said. McCoy says he hopes Solider On acquiring the long term lease for the Ann Lee building will provide that much needed help. “It’s our time to say, look we’re here for you now,” McCoy said. The project here will be similar to the location in Pittsfield, Mass., which has had great success. The whole program will also be run by veterans themselves. ALBANY — A 50-year lease agreement for the long-awaited housing project for homeless veterans in Colonie was approved by county legislators Monday night. The county Legislature gave County Executive Daniel McCoy the OK to negotiate a lease agreement for the vacant Ann Lee Nursing Home in Colonie with Soldier On, a Massachusetts-based nonprofit that provides homes for homeless veterans. A project five years in the making, Soldier On will take over the building off Albany Shaker Road, adjacent to the Watervliet Shaker National Historic District. The plan is to renovate the 91,320-square-foot former nursing home into about 100 apartments and to construct two three-story buildings with an additional 100 apartments. The Ann Lee Home closed in 2008. Majority Leader Frank Commisso has visited the Massachusetts site of Soldier On and was impressed with the operations there. “We hope the Albany County site will at least match its success,” Commisso said. The project is estimated to cost between $25 million and $30 million, Soldier On CEO John Downing has said. The money will come from a mix of state and federal support, including affordable housing grants and tax credits. With an expected $5 million to $6 million shortfall, Soldier On plans to raise the funds by direct fundraising and private foundation support. The complex will also include on-site job training and counseling services. It would be modeled after the Gordon H. Mansfield Veterans Community in Pittsfield, Mass., which opened six years ago. Mansfield is a former deputy secretary of veterans affairs. An Army veteran, he was paralyzed in Vietnam. The Colonie community will also carry his name. Leigh Hornbeck contributed to this report. SPRINGFIELD, Mass. (WWLP) – An event Saturday to raise money so that every Veteran has a place to call home. At the Knights of Columbus in East Longmeadow they held Raffles, took donations and catered a gourmet dinner to help raise money for ‘Soldier-On’ an organization that helps provide permanent housing for the men and women who serve our country. Soldier-On serves over 300 veterans in Western Massachusetts, and more than 7,000 veterans and their families across the United States. The Knights of Columbus hoped to raise between two and 4 thousand dollars Saturday night with all proceeds going to Soldier-On. ALBANY, N.Y. (NEWS10) – A dramatic rescue happened inside the Albany County Jail after a corrections officer was attacked by an inmate. The incident was caught on camera, but the person who did the rescuing that might surprise you. Video from inside the jail, in what’s called the “Soldier On” wing which caters specifically to veterans. In the video, you can see the inmates notice something happening and run to help. The attack happening outside the view of the camera, but not escaping the eyes of the inmates who rushed to help. “Jumped up. Came out of their cells. Came out of everywhere. Every one of them,” Sheriff Craig Apple said. The men are part of the “Soldier On” wing of the jail, which allows those inmates to spend time out of their cells and partners with an organization of the same name. On Tuesday, 41-year-old Drew Crowley, who is not part of the veterans program, was in the pod using the phones there. Crowley then became angry and turned that anger on a nearby corrections officer. That’s when the veterans jumped into action and Sheriff Apple says it could have saved the officer’s life. “People who are treated with consistent respect and fairness always rise to stand and protect those who serve them,” John Downing, of the “Soldier On” program, said. Apple agrees saying this rescue is a testament to the fact that people can change. Crowley has now been charged with felony assault and after another incident Thursday morning he could face even more charges. As for the officer, he will be on leave recovering from the attack for the next several weeks.